There can be no doubt about it now – gold has broken out of its summer doldrums (Gold Eagle Coin Price). On Monday, the yellow metal finally broke through the longstanding $1,300/oz resistance zone to make a new high for the year at $1,316. The next upside target is $1,375/oz, the high point for 2016. 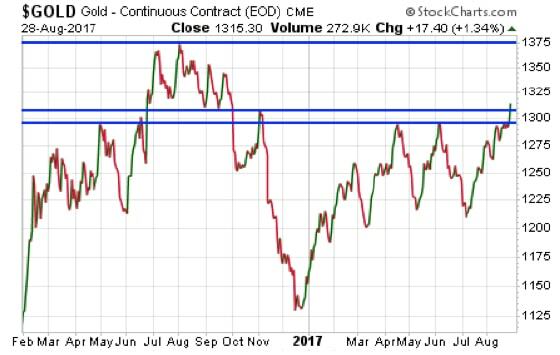 There are plenty of bullish factors behind gold’s recent upside momentum to continue pushing prices higher in the days and weeks ahead. The gold mining stocks are starting to show relative strength again. And the U.S. Dollar Index appears to have begun another new down leg this week, falling Monday to a two-and-a-half-year low. Another bullish factor is geopolitics. Gold gained a few more dollars in early trading Tuesday morning in Asia after North Korea launched a missile over Japan. Japanese Prime Minister Shinzo Abe said, "Their outrageous act of firing a missile over our country is an unprecedented, serious and grave threat and greatly damages regional peace and security." On any ordinary news day, this dangerous provocation from North Korea would be the top story on all the cable news channels. Hawks would be calling on the U.S. to retaliate, and doves would be warning of the potential for millions of deaths in the event war breaks out in the densely populated region. For now, though, the unprecedented flooding caused by Hurricane Harvey is the Trump administration’s top priority. Early estimates are that the storm has caused $40 billion in damage. Water levels are still rising in Houston, and surrounding areas extending to Louisiana, so the scale of the catastrophic losses stemming from 11 trillion gallons of water will continue to grow in the days ahead. Several major oil refineries have been shut down by the storm. However, crude oil production is little affected. Oil inventories are expected to build even as gasoline prices rise (gasoline futures jumped 3% on Monday). The disaster is bringing Americans from disparate backgrounds and worldviews together, united in a common purpose to help provide relief to those in need. Perhaps Congress will set aside some of its partisan acrimony when it goes back into session next week. Unfortunately for taxpayers, though, outbreaks of bipartisanship are usually associated with emergencies that cause both sides to agree on even more spending. The political pressure to make sure federal agencies are equipped to handle Harvey relief efforts (which will be ongoing for months) figures to be overwhelming. Conservatives who had aimed to force concessions in an upcoming budget fight may conclude that they now have no leverage to do so. 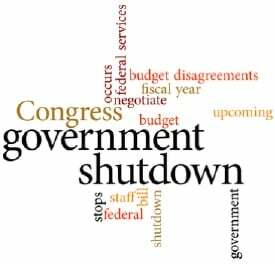 President Donald Trump so far hasn’t backed off his vow to pursue border wall funding even if Congress refuses and a government shutdown occurs. But a government shutdown in the aftermath of a major natural disaster could be a political disaster for whoever gets blamed for it. With so many risks hitting investors this week, it’s no surprise that the gold market is benefiting from safe-haven inflows. Silver is benefiting as well. Although the silver market has not yet hit a new high for the year, prices advanced nearly 2.5% Monday to close above the 200-day moving average. If silver can now start showing leadership, that would be bullish for the entire precious metals complex. The gold:silver ratio currently stands at about 75:1. Gold is still trading at a high price historically relative to silver. The ratio can move rapidly to the downside when silver prices are surging. That was the case from late 2010 to early 2011, when the ratio dropped from the high 60s to the low 30s. An even bigger move could be in store for those who buy silver now, while the gold:silver ratio is still in the 70s.